It was foggy, rainy, and cold in Beijing. The weather was the exact opposite of what we had last month in Fiji and Australia. The first destination of today was one of the most historical and culturally significant sites in all of Beijing…Tiananmen Square. This large city square (3rd largest in the entire world) was named after the Tiananmen Gate, or the “Gate of Heavenly Peace”, which is the gate that enters into the Forbidden City and Imperial Palace. As I walked around taking pictures…my tour guide educated me on some of the past and more recent events that took place on this pavement. The most recent being the Tiananmen Square Protests in 1989, where hundreds if not thousands of protestors (mostly students) were massacred by the Chinese military troops and police for protesting against the Chinese government. As appalling as this story was…what shocked me the most was the chilling feeling I got from my guide when I asked if there had been any protests or demonstrations at this place since the Tiananmen Square Massacre…”no way, it is not allowed here.” It’s been more than 20 years since that time..and the fear against their own government clearly remains. The weather isn’t the only thing different in this place…it’s a whole different world here. After taking some more pictures of the square and the surrounding buildings we started walking towards the Gate of Heavenly Peace to begin the tour of the Forbidden City. This ancient city is broken down into 2 parts, the outer court and the inner palaces. The main entrance to the palace is thru the Meridian Gate which consists of 5 openings or pavilions. We stopped at this massive gate for a quick history lesson and looked at the bird’s-eye map of the Forbidden City, all the gates, temples, palaces, pavilions, and courtyards that lie within. The Meridian Gate was so named because the Chinese emperors believed they lived in the center of the universe, and the Meridian Line went through the Forbidden city. “Why were there five openings?”, simply because people of different classes or social statues shouldn’t walk in through the same opening. The central or Meridian Walkway was reserved for the emperor alone. This was the beginning of a long history lesson on how the emperors treated the people of China. Once again…it’s a whole different world here. I realized then, before even passing through the gate, that I could spend an entire day here…mazing my way through this place that once belonged to the emperors. So much history in China with all the different dynasties and emperors that it becomes overwhelming to try and remember the difference between the Ming and Qing dynasties and all the different emperors during these times. I probably asked my tour guide a thousand questions over the 3 hours or so we spent walking thru the Forbidden City. There was definitely a lot of walking involved and as much as I wished Brandey was with me today…it would have been hard for her to get around with her sprained ankle in a wheelchair or worse…on crutches. I tried to take as many pictures and videos as possible to give her the visual of this world heritage site…but there must have been over 100 buildings at least. UNESCO listed the Forbidden City as the largest collection of preserved ancient wooden structures in the world. After finishing our walk through the Forbidden City, we jumped in the car and drove down the ring roads (the road system in Beijing is a system of circular rings) towards the Dongcheng District. Our final destination of the day is the Lama Temple which is one of the largest and most important Tibetan Buddhist monasteries in the world. This was my first experience with “Buddhism.” And once again…it’s a whole different world here. I was on my own this time…my guide waited in the car with the driver while I took an hour to walk through the beautiful courtyards and pavilions to see the world of Buddhism. Each courtyard contained a fire for lighting incense and each building housed at least one golden-yellow buddha for worship. I walked around admiring the seen and taking pictures and videos of the people bowing and praying to their buddha. Without a doubt, the main attraction of this place had to be the Giant Buddha which was carved from one piece of Tibetan sandalwood. Standing 54 feet above ground…this Giant Buddha is the largest standing buddha in the world. I got in a lot of trouble from the monks by taking pictures and videos of this buddha…evidently it is forbidden. Oops. After a long day of site-seeing and no lunch all day…I had my tour guide stop at his favorite restaurant so I could surprise Brandey with some authentic Chinese food for dinner. But just my luck…she had already ordered room service an hour ago and wasn’t that hungry (she hadn’t eaten all day). Nevertheless, she put the ice bag down that she had been using for her ankle and joined me for our first Chinese dinner. I showed her all the pictures and videos I had taken from today…and did the best to explain what I had learned from my first day in China. Thought youi might be interested in someone else doing “your thing”. 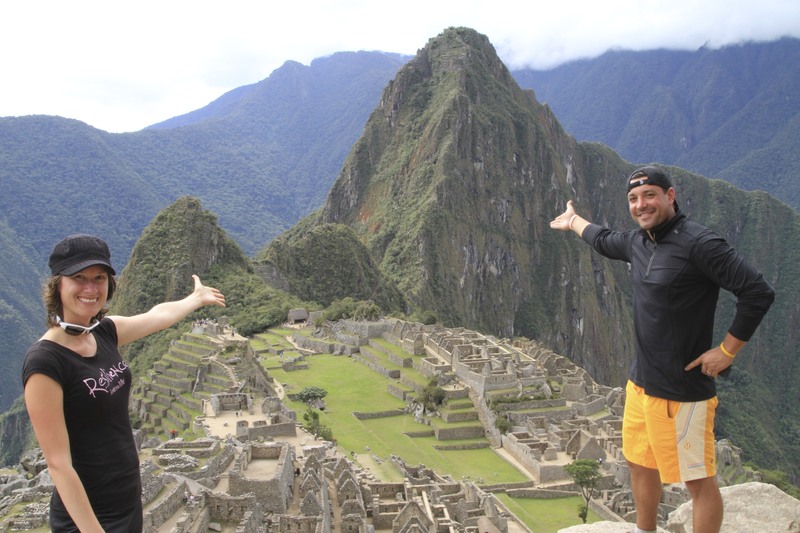 Darren and Sandy Van Soye, a couple from Southern California, have started on a global adventure to raise awareness about world geography and make the subject more accessible to children. Visiting fifty countries on six continents in 424 days, they will share the journey with more than 700 classrooms representing 50,000 students. “Our dream is to educate children about geography and world cultures so we’ve planned the ultimate trek around the world to do just that,” said Sandy Van Soye. Chronicling the journey on their TrekkingthePlanet web site, they were inspired to plan the year+ trip after experiencing first-hand the positive impact of a previous family journey around the globe. Traveling a total of 12 legs by rail, bus, air and ship, they plan to see some of the most remote and unspoiled places in the world, by visiting sites of cultural and natural significance, to instill a greater awareness and curiosity about Earth geography in as many people as possible. To make efficient use of their time and set an eco-friendly travel example, several legs of the journey will be traveled using Princess cruise ships. “We wanted to use cruise ships as part of our travel method because they offer an efficient way to reach all the different stops on our voyage while minimizing our global footprint,” said Sandy in a statement. Their full at-sea travel itinerary incorporates five different Princess Cruises voyages, totaling 96 days sea. Both the first and last legs of their journey, plus three legs in between, will be aboard a Princess cruise ship. Their full 424-day itinerary is available on their web site, where they will be journaling their trip and fans can also follow them on Facebook. The Van Soyes will complete their global journey in March 2013.